If you go to the hotel website above, they guarantee the cheapest on-line price. Parking in the hotel lot is half price at $12 a day. Whole Foods Market is right across the street, along with Tully's and Peet's Coffee (local favorite), to keep everyone well fed and caffeine happy. Starbucks is right next door to the hotel. There are lots of cheaper hotels a few blocks away on Lombard Street for those of you on a budget. 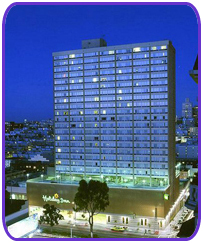 This hotel is near the cable car turn around, so you can hop on one and go to Union Square or Fisherman's Wharf. FROM NORTH: 101 South across the Golden Gate Bridge, take the Lombard St exit to Van Ness Ave, turn right on Polk Street. Proceed for about 8 blocks on Polk Street. Turn right on Pine Street and proceed for 1 block. Turn right on Van Ness and the hotel will be on your right. From EAST: Hwy 80 over the Bay Bridge. Take the Fremont Street exit. Continue on Fremont St, you will cross Market St, turn left on Pine St, Follow Pine St for approx. 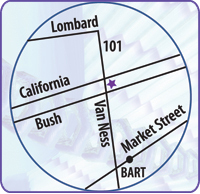 15 blocks to Van Ness Avenue, and turn right on Van Ness Ave, hotel will be on your right.